Ted Cruz on Tuesday night split two Republican nominating contests with Donald Trump, routing the billionaire in Utah but getting blown out by him in Arizona. Cruz was set to win the Utah caucuses with 69 percent of the vote, putting him on track to collect all 40 of the state's delegates. With 85 percent of the vote in, he was leading Trump and Ohio Gov. John Kasich by more than 50 points each. In Arizona, Trump was projected to easily prevail in the primary, a winner-take-all contest with 58 delegates up for grabs. With 75 percent of the vote in, he was beating Cruz by 22 points, 47 percent to 25 percent. Cruz hailed the results in Utah as a "powerful affirmation" that he is the chief alternative to Trump in the Republican race for the White House. 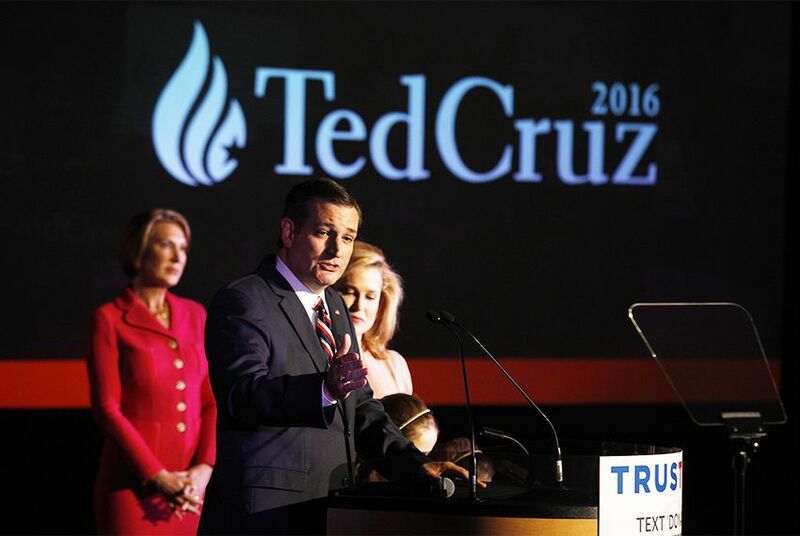 "Last night was a terrific victory," Cruz said in an interview Wednesday morning on CNN. "Utah is now the 10th state where we've beaten Donald Trump, and what we're seeing really is we're seeing Republicans uniting behind our campaign as the only campaign that has beaten Donald Trump over and over again and will beat Donald Trump." The billionaire nonetheless widened his lead in the delegate race Tuesday night, pushing closer to the 1,237 delegates needed to win the nomination. By Wednesday morning, the Associated Press projected Trump was winning 738 delegates, Cruz 463 and Kasich 143. Cruz's campaign had been expecting victory in Utah, but was less certain in Arizona. Early voting started Feb. 24 in Arizona, meaning many ballots were cast for candidates no longer in the race. "Arizona, actually, a lot of the results were baked in the cake," Cruz said on CNN. "They had been early voting for a month, and so much of Donald's win came from people who voted a month ago when the race was very, very different." The Republican presidential race took a nasty turn shortly before the results came in Tuesday night. Trump tweeted, deleted and then tweeted again a threat aimed at Cruz's wife, apparently in reaction to a photo of Trump's wife used earlier by a group not affiliated with Cruz's campaign. "Lyin' Ted Cruz just used a picture of Melania from a G.Q. shoot in his ad," Trump wrote. "Be careful, Lyin' Ted, or I will spill the beans on your wife!" Trump appeared to be referring to a Facebook ad from an anti-Trump super PAC that showed a risqué photo of his wife, a former model. The image featured a warning geared toward Mormon voters, who make up a large part of the electorate in Utah: "Meet Melania Trump. Your Next First Lady. Or, You Could Support Ted Cruz On Tuesday." Cruz responded to Trump's tweet with his own, saying, "Pic of your wife not from us. Donald, if you try to attack Heidi, you're more of a coward than I thought. #classless"
The race now turns to Wisconsin, the next major nominating contest on April 5. Cruz's campaign was already ramping up in the state before Tuesday, and the Texas senator is scheduled to spend the next three days there.